Upon download of the software, use the following instructions to upgrade QMessage Monitor on your IBM i (i5/OS) running on IBM Power Systems (System i, iSeries). Only experienced system operators or technical support staff should do the upgrade. For installation, QSECOFR (or a user profile with the same special authorities as QSECOFR) is required on the host system. The user profile must have Limited capabilities set to *NO. Do not attempt to upgrade this product without the required authority. QSECOFR authority can be obtained from your security officer. Upgrades may perform conversion of data stored by the product. If you wish to speed up the upgrade process, consider using the MMPURGE command before the upgrade in order to minimize the amount of data that is converted. This command is explained in the Housekeeping section of the user manual. 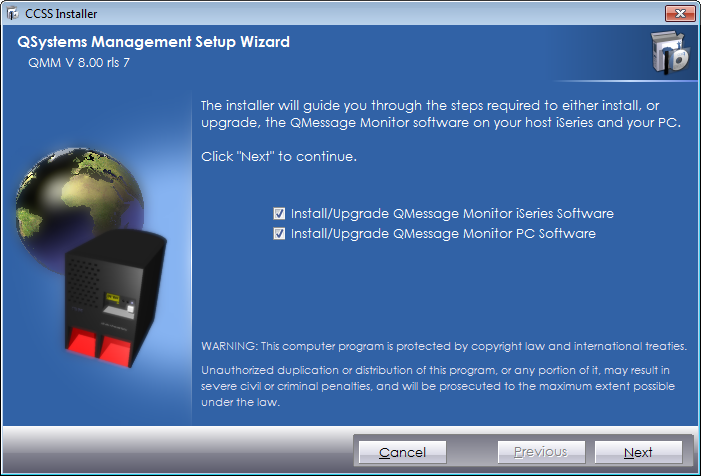 If you're a QRemote Control user, you must stop the QRC client before commencing the QMessage Monitor upgrade process. Ensure that all PC Console and Maintenance jobs connected to the monitor have been terminated. The MMTCPSVR job on the host and all remotes must be active. If you're a multiple system user, the installed library will be upgraded automatically on the host and remote systems during the upgrade procedure. To perform a product upgrade or fix upgrade from the PC, there must be a TCP/IP connection and the ability to FTP between the PC and the host IBM i. The IBM i user profile you use must also have authority to execute CL commands via FTP. During the upgrade, both the server (IBM i) and the client (PC) software are loaded in the same session. Select the options for the upgrades you want to perform. You can upgrade both the server (IBM i) and the client (PC) software in the same session, or upgrade only one of them. Click Next. If you chose to upgrade the PC software in step 2, enter the directory where the software will be installed. Click Browse to select a different directory. After you've selected a directory, click Next. Enter name and communication information for the host IBM i system (details are below the image). System Name Enter the name of the host system that the software is loaded on. IP Address Enter the TCP/IP address or DNS name to communicate with the host system. Show Advanced Select Show Advanced to change the port number of the FTP service and QMessage Monitor. This is normally port 21 and 3069. User Enter an existing user profile from the host IBM i. Be sure it has the correct authority to upgrade the product. Click Next to continue. The installer determines whether or not a version of the software already exists on the host IBM i system. Based on the software currently installed on your systems, the Select Upgrade Type screen displays with the recommended upgrade type already selected (don't change the selection unless instructed to do so by CCSS Technical Support). The options are Full Upgrade or Quick Upgrade. A Full Upgrade is the only option available when moving from one product version to another. For example, upgrading from QMM V7 to V8. A Quick Upgrade is typically used when upgrading from one release of a product version to a higher release. For example, upgrading from QMM V8R01 to QMM V8R07. 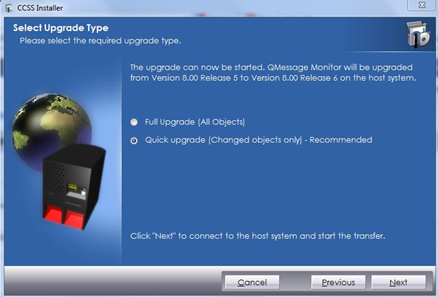 The installer transfers the upgrade package to the host system; an indicator shows the progress of the operation. 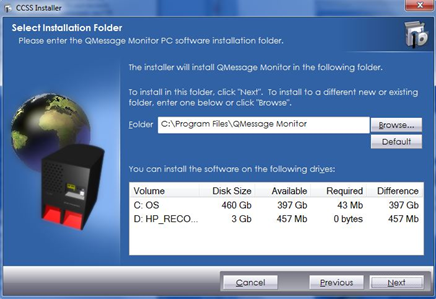 Messages from the IBM i portion of the installer are displayed in a window on the screen. When the transfer is complete, the latest versions of the objects are installed to the QMM destination library. 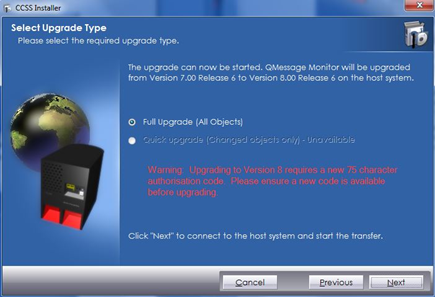 Note: The upgrade process continues in the background on remote systems after the installer has completed on your PC. 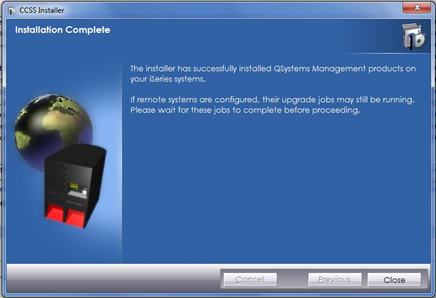 Remote systems automatically become available again after the upgrade has completed on them. If you're upgrading from Version 6 or 7 to Version 8 or higher of QMessage Monitor, wait for the remote jobs to complete before activating the 75-character codes. 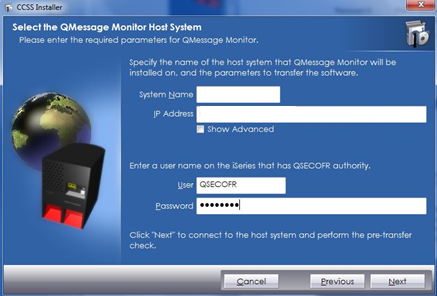 When any module of the QMessage Monitor PC software is started and connects to the host system, and if the PC software is Version 7 of QMessage Monitor or higher, it automatically checks whether the software on the host system is a higher release or version. If yes, you're prompted to either allow the PC software to update itself or to close the module.